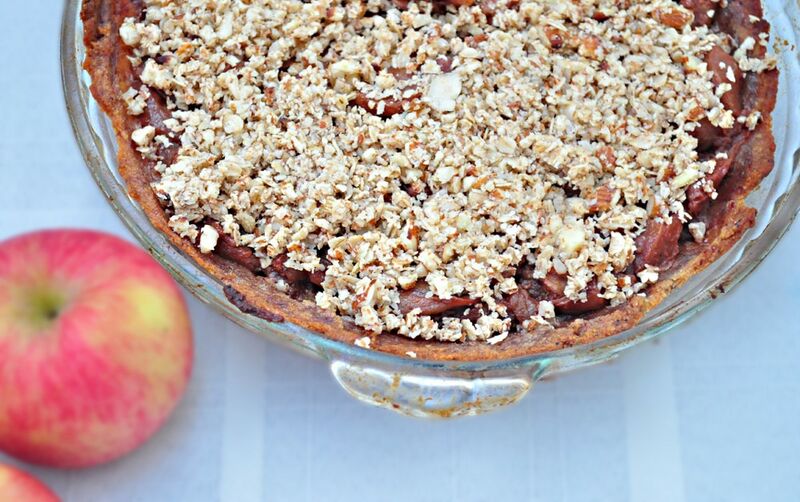 Apple Pie that is vegan and gluten free! Last night I had the urge to make crock pot applesauce. Just thinking about it reminds me of the applesauce my great grandmother used to make when I was little. After I gathered all the ingredients, made the apple sauce, and tasted the final product, I immediately thought to make a homemade apple pie. Here in Dallas today, its cold and overcast. Just perfect for staying in and enjoying some comfort food. I re-vamped this recipe to make it gluten free as well as paleo friendly. It’s super easy! I made the apples in the crock pot, but you can probably to it in the instant pot as well. Want to make this recipe? Watch the video below. For more videos, please subscribe to my You Tube Channel. Cook of high, stirring every once and a while, and it should be done in 3-4 hrs. Throw everything in the food processor until a dough starts to form. Press dough into a greased pie shell. Bake for 9 minutes. Let cool. 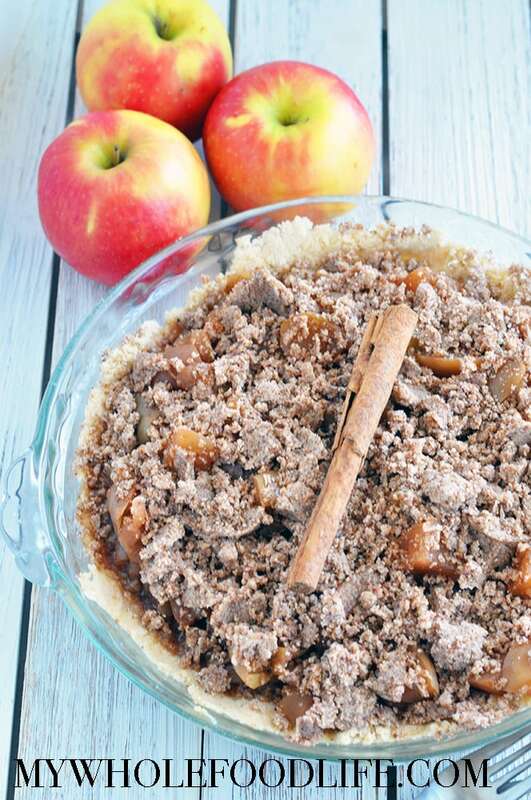 Once the apple mixture is done, add it to the pie crust. Sprinkle on top of the pie. Bake in the oven at 350 for about 5 minutes. Hi Melissa, Still a little confused on your instructions. So no baking at all with the grain free option, not even with the topping? And for the other crust option, bake 30-35 min? I want to make this for guests so wanted to be 100% clear before I do :) Thanks! There is no baking of the crust itself. 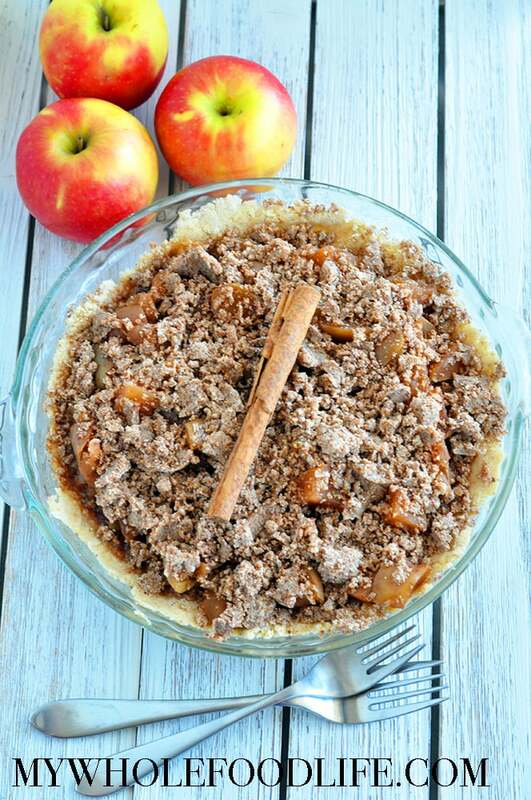 However, once you add the apple mixture you will need to bake. I hope that makes sense? Hello!! I am looking to make a peach pie, cobbler or crust. Do you think I could use frozen peaches? not slow cooked though just straight from bag. Also what do you think about coconut, oat or spelt fours? Spelt or oat flour will work for sure. I am not sure about using frozen peaches. Maybe if you let them thaw first? i have my applesauce cooking now. I have a question though do I bake the pie and crust for 25-30 minutes and the add topping and bake for another 25-30 minutes? Or is the whole bake time 25-30 minutes. Thanks! Made the grain-version for Thanksgiving. It was great. Just wish the crust was not that dry. I did not use any maple syrup in the filling (apples, cinnamon, and gloves make it sweet enough). Thank you for all your recipes! Sorry the crust was a little dry for you. :( Maybe next time add a little water? This looks delicious! I want to make it over the weekend. I just need one clarification though (sorry if you've been asked this many times, I just couldn't figure it out from the questions above) - if I'm making the grain crust, do I bake the crust by itself first for 25 minutes, THEN add the filling and topping and bake another 25-30 minutes? Or do I bake the whole thing for 25-30 minutes? I think many questions above are for the grain-free crust, but I'm using the grain crust, so I'm wondering if there's a difference... Thanks!!! For the grain crust you bake the whole thing 25-30 minutes. You are so welcome Alma! Made this today and it's delicious! Thank you for a great, easy recipe! PS. ~ I used Granny Smith apples as well. That's awesome Mona! Glad you enjoyed it. Hi Melissa, I made this last night with the grain free crust. (I did not see a grain option) It is delicious, but the crust was a little soggy from all the apple liquid. I baked the crust for 9 minutes, let it cool and then added the apple mixture and baked for 15 minutes (5 didn't seem long enough for the crumble to bake). Next time I may bake the crust a little longer. It was still great and we still ate half the pie! Glad you liked it, but sad it was a little soggy. :( Did you scoop the apple mixture out with a slotted spoon? That may help next time if you hadn't tried it already.